Maybe I use the word “sleepy” too much to describe Laos, but it is a fitting word. 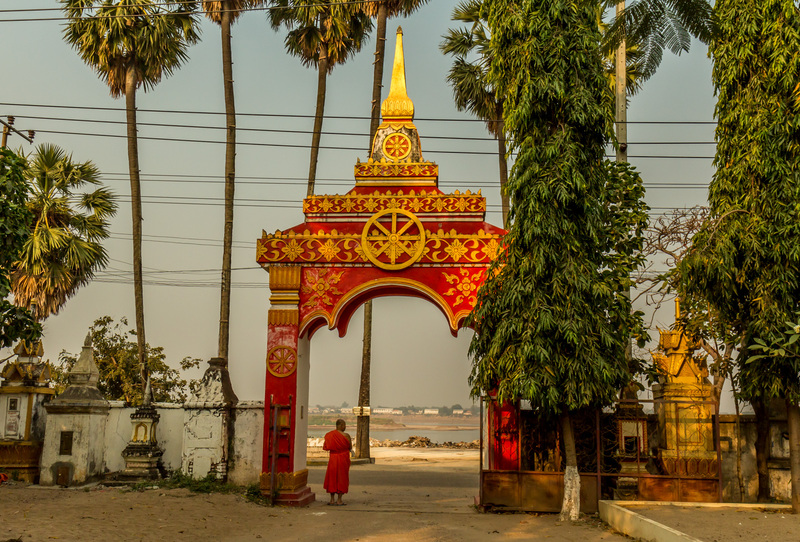 If I went back to my guesthouse in Savannakhet after 8 pm, I would have to wake the owner up so he could unlock the gate and let me in. My plan for today was to walk around the old part of the city in the morning, then get my bike looked at again. 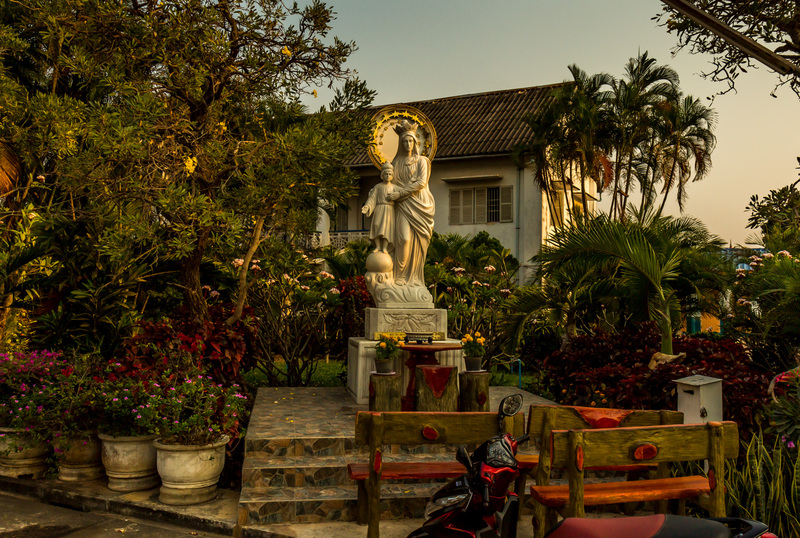 I walked around for a couple hours, photographing the French colonial buildings. The whole city is really spread out, including the old town. You can’t easily walk anywhere. The blocks are really long. 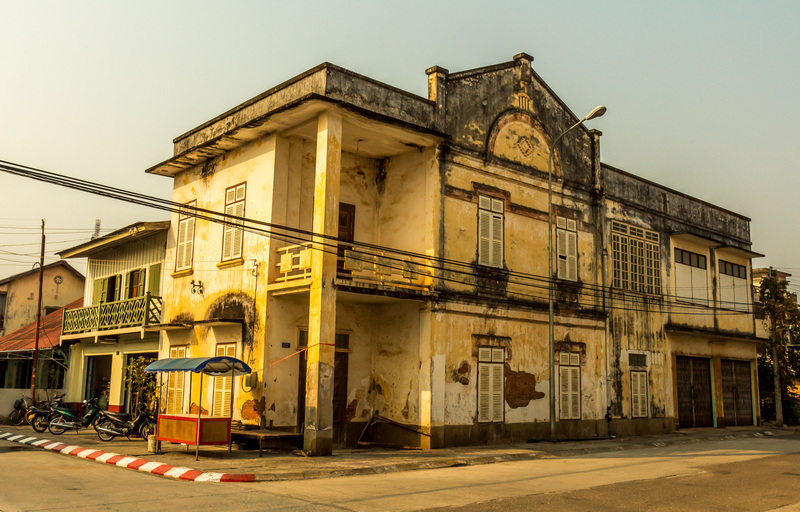 There are some interesting old buildings scattered around, but it’s not like Luang Prabang, with one street lined with them. As I wandered around, I noticed how deserted the place felt. 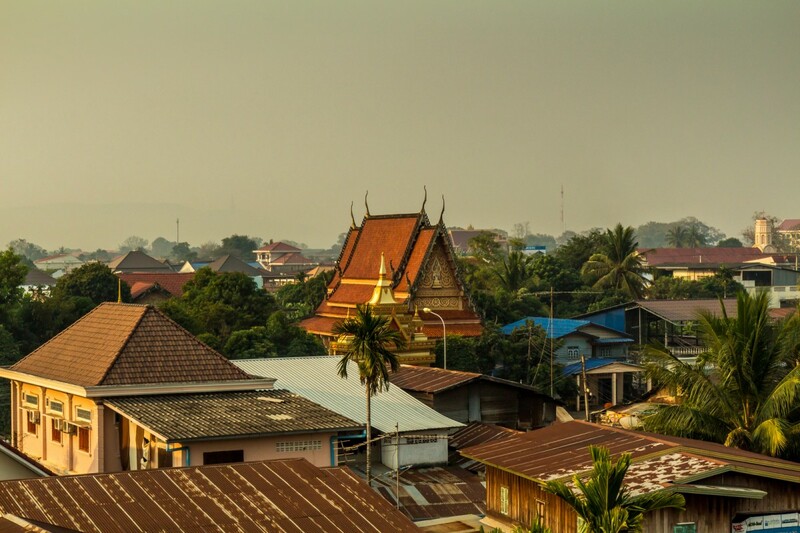 This is really one of the largest cities in Laos? There was no traffic. Many businesses were closed, and there were very few people about. Maybe because it’s Sunday. There are hardly any falang tourists here. The old town doesn’t have any guesthouses, and only two cafes, one of which is closed. 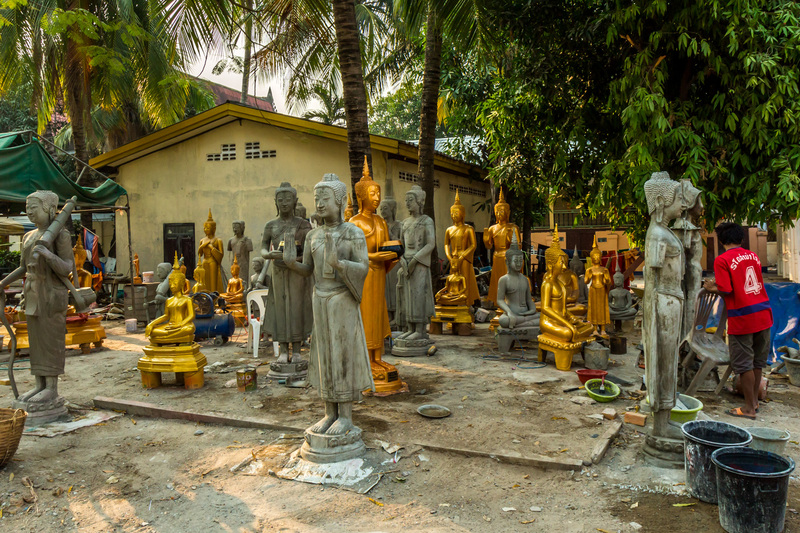 It seems like there is untapped tourist potential in this town, especially since it is just across the river from Thailand. Supposedly there is trekking available to the hinterlands. It was hard to find the tourist information shop, but I eventually did. It was closed. I looked for a travel agent, but it was closed too. That’s OK. At this point in the trip, I’m not really up for more trekking. I wandered to the little museum, but that was closed too. That about wrapped up my morning walk. So I got my motorbike and rode down one of the long main streets looking for a mechanic. I found one and he tackled the problem. He worked on it for more than an hour, and got it working. I also had him bang on my bent footrest to straighten it. I don’t know why I didn’t do that a long time ago. He wanted 90,000, which was more than they asked for yesterday. My hotel had a brochure on a little loop through the countryside outside of town to a lake and an old temple. Riding motorbikes is what I do, so I figured I’d try that. 10 km outside of town the speedometer/odometer broke again. 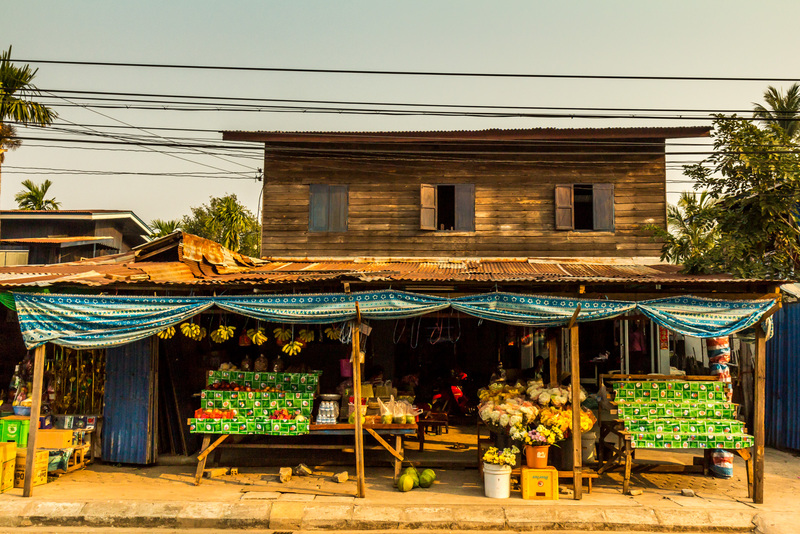 Old building with fresh fruit. The brochure showed a thick red line going right to the lake, which was one of the two routes Google Maps showed. But it quickly deteriorated into a dirt road, then a sand road, then a cow path. I backtracked and tried the other route. That one went to the lake. There were some local restaurants there, and scenic rice fields. I followed the loop until I came to the old stone temple, which is just a stupa. It was full of Lao people making offerings, which is always interesting to see. Maybe today is a holiday? I was the only falang. I had put my bike for sale on a few traveler websites, and a guy in 4,000 Islands offered me $300. That is really low, but I think I will take the offer if he really wants to buy it. I know I can get $500 in Vietnam, but it would cost me at least $200 go all the way back to Saigon. At night I went to the little night market in the center of the old town near the church. 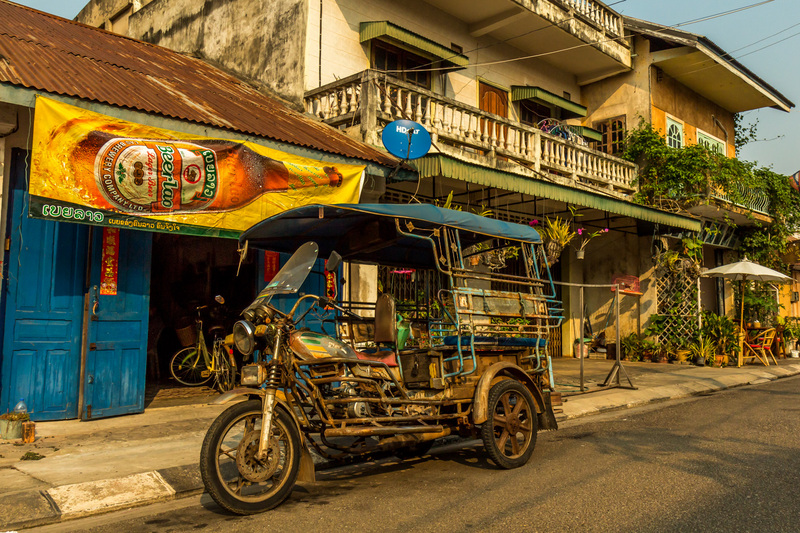 It is probably the livliest part of town, with some stalls selling street food, and a little bar in one of the colonial buildings lining the square. Locals outnumber tourists in the market and the bar. But it is tiny affair. 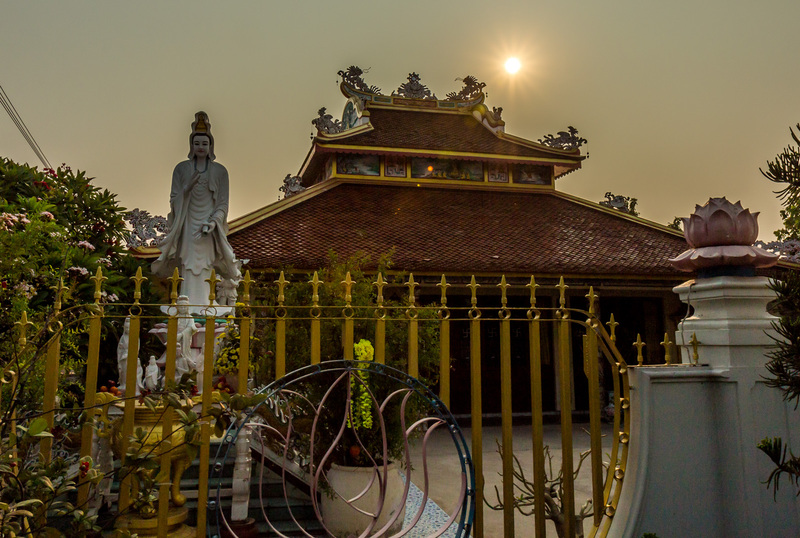 Savannakhet is an amazingly low key place for being the second or third largest city in Laos. Tuk tuk in the old town. Some of the buildings are impressive.